In Criminal Law, we examine the black letter rules of criminal law most commonly tested on the MBE and in law school. 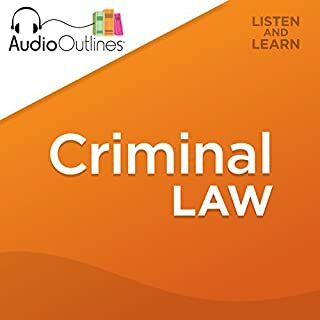 By combining a simple approach to legal learning with the innovative appeal of an audio study aid, Criminal Law provides you with a concise overview of the subject matter in a way that makes it easy to learn, understand, and memorize. Criminal Law also includes numerous hypothetical examples and analyses to help you apply the rules of law to analyze any given fact patterns. In Constitutional Law, we discuss the basic rules under the Constitution of the United States. We examine significant clauses within the Constitution and their interpretation over time, landmark Supreme Court cases, and many other topics covered in constitutional law, with numerous examples and analysis. Narrated by: Rafi Nemes J.D. In Tort Law, we examine the black letter rules of tort law tested on the MBE and in law school. 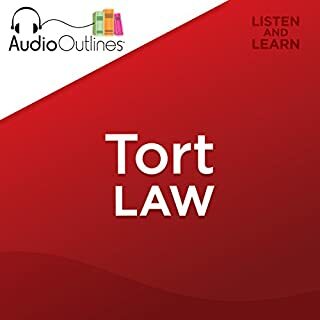 By combining a simple approach to legal learning, with the innovative appeal of an audio study aid, Tort Law provides you with a concise overview of the subject matter in a way that makes it easy to learn, understand, and memorize. Tort Law also includes numerous hypothetical examples and analyses to help you apply the rules of law to analyze any given fact patterns. awesome bar study aid when you are in your car. In Contract Law, we examine the black letter rules of contract law most commonly tested on the MBE and in law school. Contract Law provides you with a concise overview of the subject matter in a way that makes it easy to learn, understand, and memorize. Contract Law also includes numerous hypothetical examples and analyses to help you apply the rules of law to any given fact patterns. AudioLearn Law School Course Outlines presents Evidence Law. 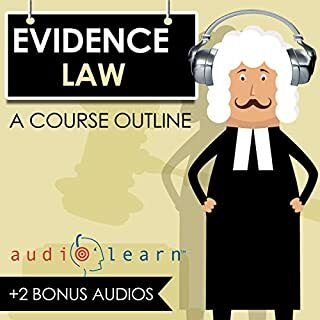 Written by distinguished law professors and professionally narrated for easy listening, this outline covers what is typically taught in a law school evidence law course. Included are detailed explanations of critical issues and topics you must know to master the course. Written by distinguished law professors and professionally narrated for easy listening, this outline covers what is typically taught in a law school wills and trusts course. Included are detailed explanations of critical issues and topics you must know to master the course. Developed by experienced professors and professionally narrated for easy listening, this course is a valuable tool when preparing for your Multistate Bar Examination or MBE. The audio is focused and high-yield, covering the most important topics you need to know to succeed on the MBE. Criminal procedure can be one of the most difficult areas to study in the law. This audiobook will go over some of the most important cases that have shaped criminal procedure over the decades. You'll learn everything from jurisdiction, venue, how to plead a complaint properly, and even an overview of class actions. The most important part of each case will be the holding and rationale, so you can use these cases to apply to future fact patterns you encounter both in studying for a bar exam or practicing the law. Written by authorities in the field and professionally narrated for easy listening, this outline covers what is typically taught in a law school criminal procedure course. Included are detailed explanations of critical issues and topics you must know to master the course. Inside you'll find: case studies, key takeaways, and review questions. This audiobook provides legal briefs for the top 100 cases that have formed the foundation of evidence law in the United States. Each case brief will cover the facts, procedural history, issue, holding, rule, reasoning, disposition, dissents, or concurrences. Evidence law can be one of the most difficult areas to study in the law. This audiobook will go over some of the most important cases that have shaped evidence law over the decades. You'll learn everything from jurisdiction, venue, how to plead a complaint properly, and even an overview of class actions. This audiobook provides legal briefs for the top 100 cases that have formed the foundation of criminal law in the United States. Each case brief will cover the facts, procedural history, issue, holding, rule, reasoning, disposition, dissents, or concurrences. Criminal law can be one of the most difficult areas to study in the law. This audiobook will go over some of the most important cases that have shaped criminal law over the decades. You'll learn everything from jurisdiction, venue, how to plead a complaint properly, and even an overview of class actions. AudioLearn Law School Course Outlines presents Corporate Law. 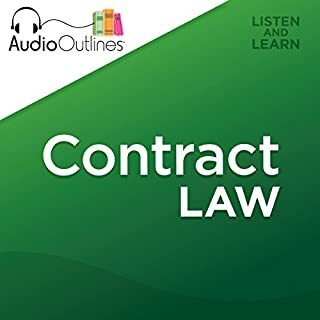 Written by distinguished law professors and professionally narrated for easy listening, this outline covers what is typically taught in a law school corporate law course. Included are detailed explanations of critical issues and topics you must know to master the course. Fine basics; WAY too much "bonus audio" filler! This audiobook provides legal briefs for the top 100 cases that have formed the foundation of civil procedure in the United States. Each case brief will cover the facts, procedural history, issue, holding, rule, reasoning, disposition, dissents, or concurrences. Civil procedure can be one of the most difficult areas to study in the law. This audiobook will go over some of the most important cases that have shaped civil procedure over the decades. AudioLearn Law School Course Outlines presents family law. 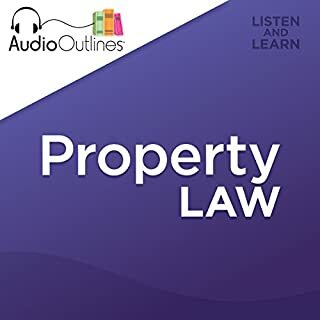 Written by authorities in the field and professionally narrated for easy listening, this outline covers what is typically taught in a law school family law course. Included are detailed explanations of critical issues and topics you must know to master the course. AudioLearn Law School Course Outlines presents Constitutional Law. 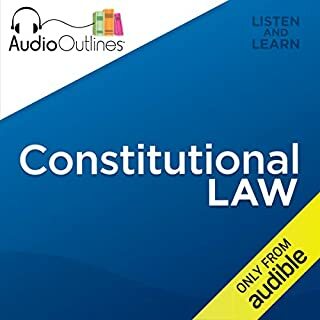 Written by distinguished law professors and professionally narrated for easy listening, this outline covers what is typically taught in a law school constitutional law course. Included are detailed explanations of critical issues and topics you must know to master the course. In Criminal Procedure, we explore the fundamental black-letter rules of criminal procedure most commonly tested on the MBE and in law school. 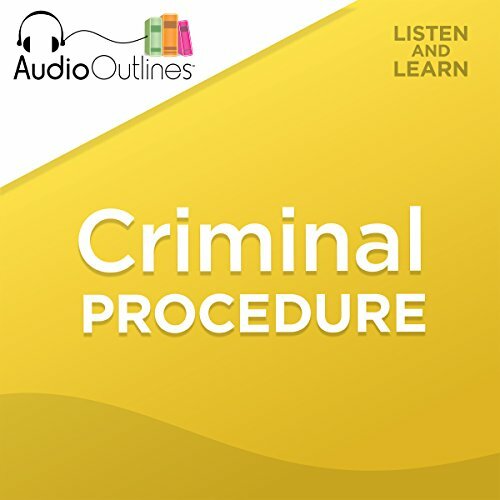 By combining a simplified approach to legal learning with the innovative and on-the-go appeal of an audio study aid, Criminal Procedure provides you with a concise overview of the subject matter in a manner that truly makes it easy to review and memorize. Criminal Procedure also includes numerous hypothetical examples and analyses to help you apply legal reasoning in analyzing fact patterns. AudioOutlines creates innovative legal study aids customized for audio that are designed to simplify the learning process and help you gain a solid understanding of the subject matter. Listen and learn, anytime anywhere, with AudioOutlines. Disclaimer: Please note this publication is for educational purposes only and is provided as is. AudioOutlines does not render legal or other professional advice.